Nature photographers wait at Yosemite National Park until the moment when the sun and earth align to create a fleeting phenomenon, the firefall. This marvel of celestial configuration happens in a flash at sunset in mid-February – if the winter weather cooperates. On those days the setting sun illuminates one of the park’s lesser-known waterfalls so precisely that it resembles molten lava as it flows over the sheer granite face of the imposing El Capitan. “Horsetail is so uniquely situated that I don’t know of any other waterfall on earth that gets that kind of light,” said Michael Frye, who wrote the book “The Photographer’s Guide to Yosemite”. “How many are perched on a high open cliff? Most are in an alcove or canyon and won’t get the sun setting behind it. Yosemite’s special geography makes this fall distinctive,” Michael Frye said. Four decades ago, photographers had only to point and shoot to capture another famous Yosemite firefall – a man-made cascade of embers pushed from a bonfire on summer nights from Glacier Point. But photographing Horsetail is a lesson in astronomy, physics and geometry as hopefuls consider the azimuth degrees and minutes of the earth’s orbit relative to the sun to determine the optimal day to experience it. They are looking for the lowest angle of light that will paint Horsetail the colors of an iridescent sunset as rays reflect off granite behind the water. It materializes in varying degrees of intensity for the same two weeks every year. “If you hit it at just the right time, it turns this amazing color of gold or red-orange,” said Michael Frye, a photo instructor with the Ansel Adams Gallery in the park. Ansel Adams photographed the fall, but his iconic black and white images do not capture its fiery quality, and it’s unclear whether he ever noted it. To be successful in photographing the watery firefall, it takes luck and timing, and the cooperation of nature. 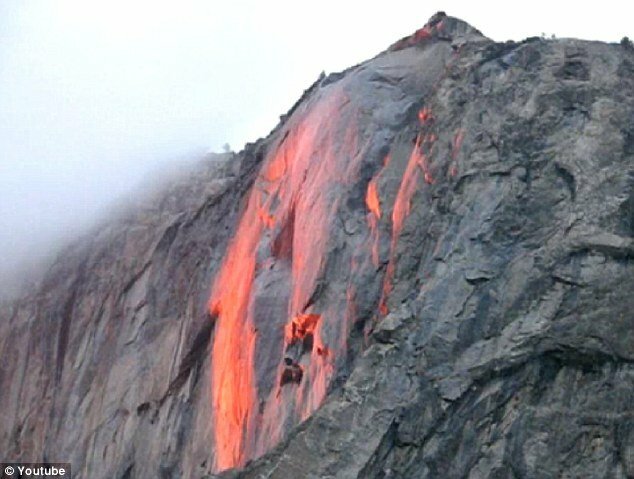 Horsetail Fall drains a small area on the eastern summit of El Capitan and flows only in the winter and spring in years with adequate rain and snow, which is scarce this year. Experts say it doesn’t take a lot of water for the fall to light up. When conditions come together, the scrawny Horsetail Fall is the shining star of a park famed for its other waterfalls raging Yosemite Fall and Bridalveil Fall. But Horsetail is the longest free-falling one, with a drop of 1,500 feet before it hits granite and spills another 500. The popularity is reminiscent of an actual fiery fall that entertained guests in the park from 1930 to 1968. Each summer evening as the sun set, employees of the park concessionaire would build a huge red fir bark fire atop Glacier Point. At 9 p.m., as the fire burned down to embers and the Indian Love Song waned, someone would yell, “Let the fire fall!”. “There’s no comparison, and I’ve seen both,” said park spokesman Scott Gediman.